We're nearly three years into running Catalog PhD projects (click here for your own copy of the original text from Amazon). When the catalog division was shut down at Nordstrom, way back in 2005, customers would distribute along a fairly even axis. Grade A (Mail 20+ Times A Year) = 10%. Grade B (Mail 10-20 Times A Year) = 15%. Grade C (Mail 4-9 Times A Year) = 20%. Grade D (Mail 1-3 Times A Year) = 25%. Grade F (Mail 0-1 Time A Year) = 30%. Sure, there were more marginal customers than outstanding customers, but the distribution was somewhat even. Grade A (Mail 20+ Times A Year) = 5%. Grade B (Mail 10-20 Times A Year) = 10%. Grade D (Mail 1-3 Times A Year) = 30%. Grade F (Mail 0-1 Time A Year) = 35%. In other words, customers were moving "downstream". With e-commerce and the myriad channels associated with e-commerce driving sales (hint - Google), catalogs were less important. By mailing fewer catalogs, profit could easily be generated. The theme of all of my work was "mail less often". By and large, catalogers did not like this message - so in spite of the opportunity to be far more profitable, catalogers turned to the co-ops, looking to turbocharge sales. Now, in mid 2013, the results have evolved again, this time fueled by demographics and mobile. Grade B (Mail 10-20 Times A Year) = 3%. Grade C (Mail 4-9 Times A Year) = 15%. Grade D (Mail 1-3 Times A Year) = 22%. Grade F (Mail 0-1 Time A Year) = 50%. There are two significant changes. Can you spot them? The number of customers to mail 0-1 times a year is growing, rapidly. This is fueled by three unique issues ... first, the economy never recovered, so there are far more marginal customers today than in the past ... second, mobile is changing the world, with mobile customers tied to apps and engaging content, catalogs have less importance ... and third, demographics - with Jasmine having little interest in catalogs. The number of customers to mail 20+ times a year is growing, rapidly. This is fully fueled by Judy making choices - she is moving to catalog (more than in the past five years), and is not participating in the mobile ecosystem. Sure, she uses mobile devices, then transacts because of catalogs. What does this mean for the profitability opportunity identified by Catalog PhD projects? 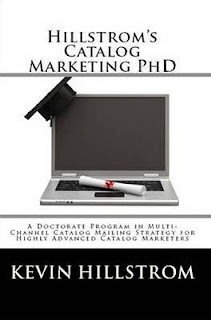 In late 2010, more than 70% of the profit opportunity comes from mailing fewer catalogs to the bottom of the file. In mid 2013, more than 50% of the profit opportunity comes from mailing more catalogs to the top of the file. In other words, your customer file is splitting apart. The majority of the customer file (Jennifer / Jasmine ... ages 18 - 51) needs dramatically fewer catalogs. A portion of the customer file (Judy ... age 52 - 68) actually needs MORE CATALOGS. More. We don't have enough catalogs in the contact strategy stream to meet her needs. We've been told, for ages, to be multi-channel / omni-channel ... to be all things to all customers across all channels. The data is telling us something fundamentally different. The data is telling us that customers are moving in opposite directions ... by appealing to all of them, we potentially satisfy none of them. The data tells me that we are going to have to become much smarter at managing unique customer segments. Ready for your own Catalog PhD project? I'd think so, given the dramatic changes I'm seeing due to demographics, fueled by mobile (and Google). Click here to contact me, right now! * How do customers end up with these grades? Is it based on spend or response or what? * What is the relationship between the grades and demographics? * Did customers that eventually end up at Grade F start out being treated like they were Grade A but failed resulting in progressively fewer mailings? If so, how many customers today have the opportunity to start out with Grade A treatment given the overall decrease in mailing as a contact strategy? The grades are a function of three equations. (1) Probability of a customer buying in the next twelve months (say 30%). (2) Amount the customer will spend if the customer purchases in the next twelve months (say $100). (3) The percentage of future demand that will not be driven by catalogs (say 60%). (4) We multiply (1) by (2) by (1 - (3)) ... 0.30 * 100 * (1 - 0.60) = $12.00. (5) The $12.00 figure is how much a customer will spend in the next year due solely to catalog marketing. (6) My grades (A/B/C/D/F) are based on this $12.00 figure. Grades and Demographics - customers who are 55+ tend to earn grades of A/B/C ... whereas customers who are 35 or younger tend to earn grades of C/D/F ... simply because these customers, based on mail/holdout tests, are less likely to purchase because of catalog mailings. If a customer purchases over the phone on a first order, the customer is likely to start as an "A", and then drop off over time if the customer does not repurchase. If a customer purchases on an iPad after clicking through a paid search campaign, the customer is likely to start as a "C", and then drop off over time if the customer does not repurchase. If future purchases are catalog-linked, the grade will bump up to "B". If future purchases are online or mobile focused, the customer is likely to stay in the C/D/F range.